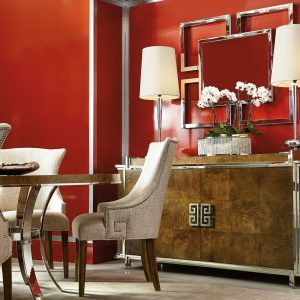 Shopping for contemporary media cabinets and console tables for your home? You’ve come to the right place! 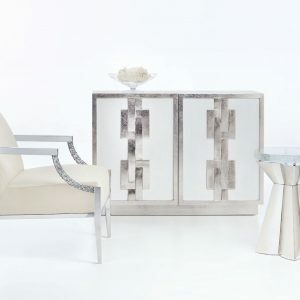 Katzberry is a leading provider of distinctive home decor online, and we carry some of the most unique furniture pieces on the market. 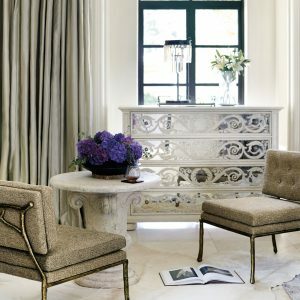 Browse our collection of media cabinets and console tables for your family room, bedroom, or living room today. 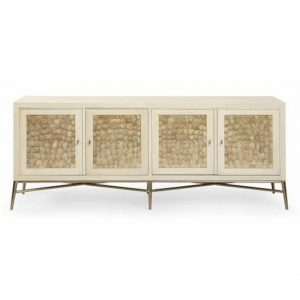 Once you find the perfect media cabinet for your space, make sure to check out our outdoor living furniture, home accessories, and interior lighting solutions. 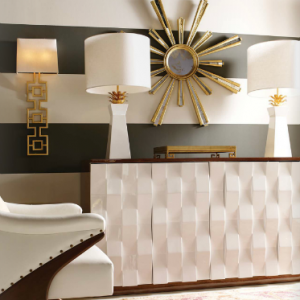 If you have any questions about our contemporary online furniture store, or you’d like to learn more about a particular product, get in touch with our team today. 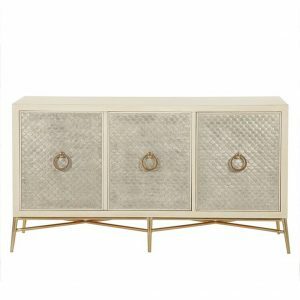 This 2-door cabinet has White Lacquer case with Silver Leaf finish on frame and base. Has a cast resin buckle design on doors, both doors have soft-close hinges. Behind each door is one adjustable/removable shelf and covered white grommet hole in back panel for wire management (white interior). Comes with adjustable glides and anti-tip kit. 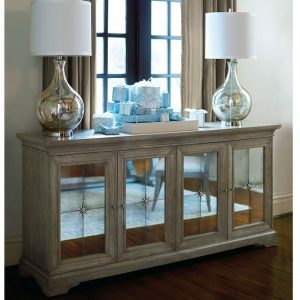 The Salon Buffet has maple veneers with an Alabaster finish. 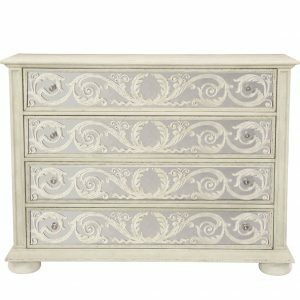 It has 2 sets of doors with beautiful inset Capiz shells. Behind each set of doors is one tray drawer and an open compartment. Left tray drawer has wrapped pad. Right tray drawer has silverware insert. 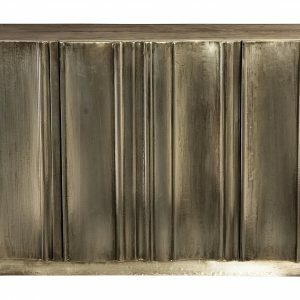 Has plated steel base with stretchers. 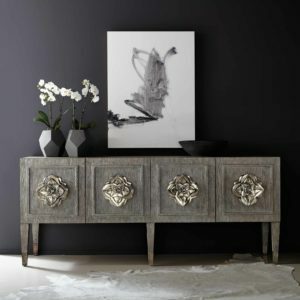 This elegant cabinet has a very dark expresso, almost black finish. 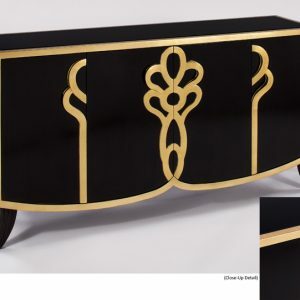 It features an elegant gold leaf design, has a black glass insert top. Opens up to one full center area and two small side storage areas. Each section has one adjustable shelf. 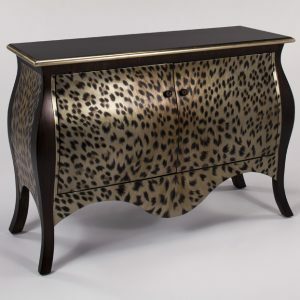 This contemporary cabinet has a finish of Leopard spots on a silvery, gold back ground with tawny highlights. Top and sides are dark mahogany color. Opens in front to one adjustable shelf. A true conversation piece. 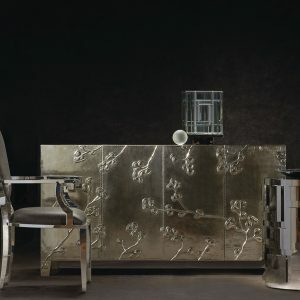 Silver leaf finish cabinet features a scroll butterfly like shape design. Has black glass insert on doors, all four doors open and has adjustable shelving in each section. 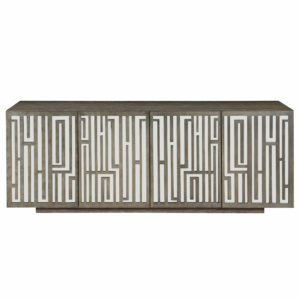 Media Chest has 4 drawers with antique mirrored drawer fronts and decorative carving and border overlay. Sits on bun feet and has adjustable glides. Comes with center support leg and anti kit. 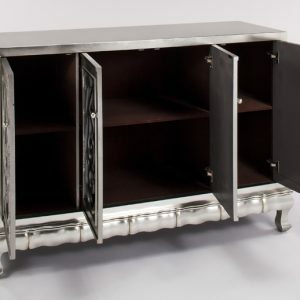 The Carleton Entertainment Console has a German Silver Wrapped case, three doors and stylish paneled front. 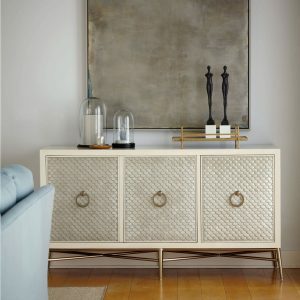 Behind each door is one drawer with hand cut-out, one adjustable/removable shelf and one covered grommet hole in back panel for wire management. Has painted black interior and case back. Comes with adjustable glides and anti-tip kit. 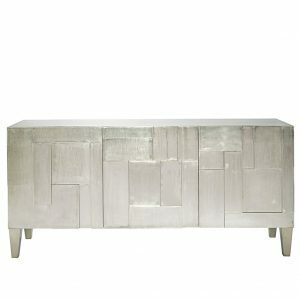 This sideboard has a Gray Cashmere finish. 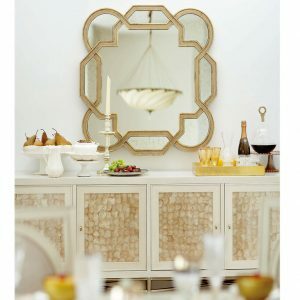 It is quartered white oak veneers, with 4 wood-framed doors and inset antiqued mirror glass panels accented with metal rosette. 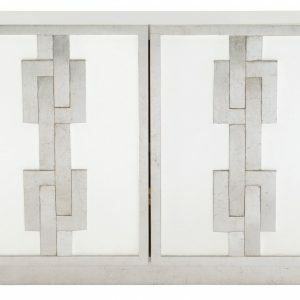 Behind left pair of doors are 2 drawers is one fixed shelf, one drawer with hand-cut out and silverware insert. Below drawer is one adjustable removable shelf. Ventilation holes and 2 grommet holes with covers in back panel. Behind right pair of doors are two adjustable removable shelves. Comes with adjustable glides, center support leg and Anti-tip kit. 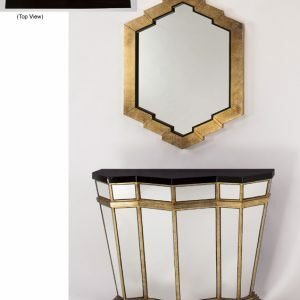 This console table has a w shape design, and features a mirrored multi-faceted front with gold leaf detail and an expresso finish top. 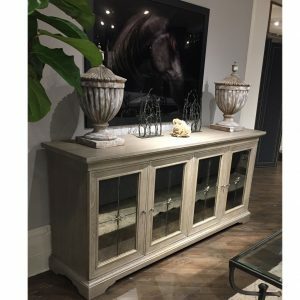 Perfect accessory for an entry way. 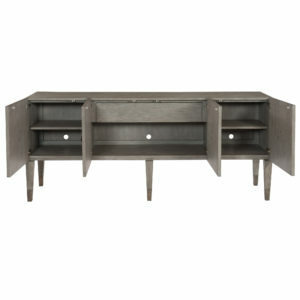 This Nightingale Credenza has sandblasted Oak veneers in weathered Greige finish. 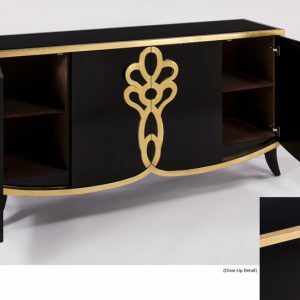 The four gorgeous floral detail makes this piece unique. They are pull-to-open doors with soft/self closing hinges and floral hardware is cast aluminum. 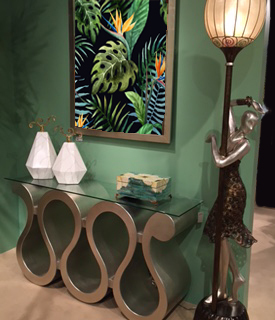 Contemporary cabinet with woven effect on front cabinet doors. 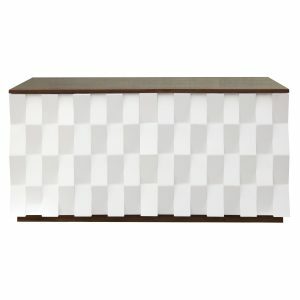 It has a Rosewood base that surrounds with 4 White Lacquer faceted front doors. Has center open swing doors with one adjustable shelf in each with grommet holes. 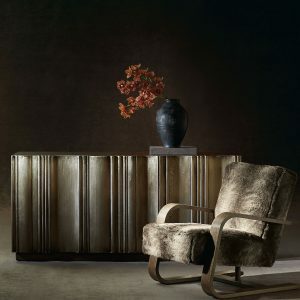 The Salon media cabinet has maple veneers with an Alabaster finish. 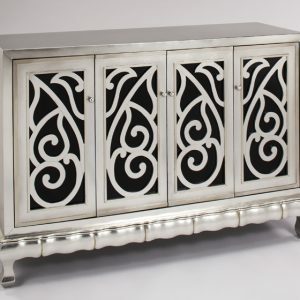 It has 3 doors with inset Antiqued Silver Leaf carved panels. Behind left and center doors are two adjustable/removable shelves. Ventilation holes and one hole in back panel for wire management. Behind right door there are 3 drawers. 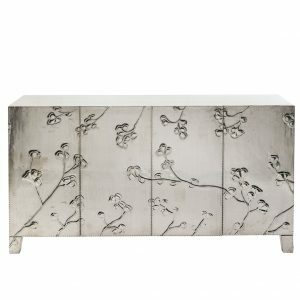 This gorgeous credenza features a flower theme with nickel alloy wrapped case in German Silver finish (including back side). It has two pair of doors. Behind Left doors is one adjustable/removable shelf. Behind Right doors is one tray with finger pull and one adjustable/removable shelf. Grommet holds in back panel and glossy white interior finish. Has adjustable glides and anti-tip kit. 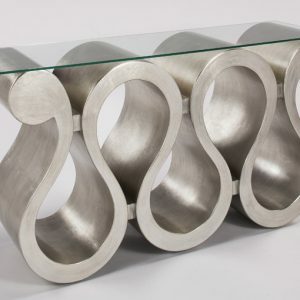 This organic shaped contemporary console table features a silver leaf finish swirl design with a glass table top. 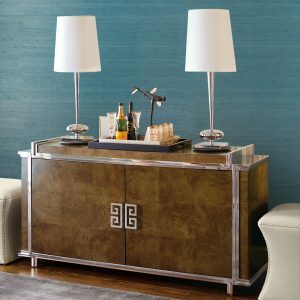 Soho Luxe cabinet has a Stainless Steel frame in Polished Brass finish, mirrored inset glass top and end panels, Dark Caramel finish on Fancy Face block pattern of White Ash Burl veneers. Has 2 swing open doors. Behind each door is one open top compartment with covered grommet hole and vented back panel. 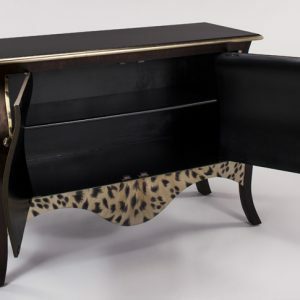 Below compartment has 2 middle drawers with hand cut-out, right drawer has silverware insert, left drawer has wrapped pad. Bottom shelf has adjustable removable vented shelf. Comes with adjustable glides and anti-tip kit. 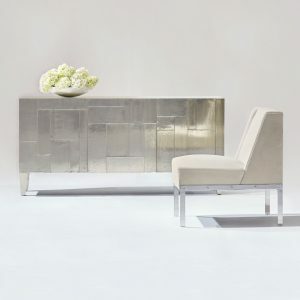 Beautifully styled for a subtle paneled design with a German Silver finish. Has 3 doors with touch latch. Behind each door there is one drawer, one adjustable/removable shelf and grommet holes in each back panel. Interior is painted black, comes with adjustable glides and anti-tip kit.